If you’re looking for a fun group trip this winter, you can find the perfect destination within the GTA! Home to 2 major sports franchises and located right in the heart of downtown, the newly renamed Scotiabank Arena is a great place for your next group road trip. No matter where you are in the city, this arena is easy to get to from anywhere, especially if you gather your friends and rent a school bus to take you there! What could be better than being surrounded by thousands of excited, popcorn eating fans at an arena cheering on your favourite team? An afternoon at Canada’s busiest sports and entertainment venue is sure to excite any size group. Whether you’re there to watch basketball or hockey, there is plenty to see at the Scotiabank Arena. It has recently undergone some renovations, so you’ll want to plan a winter trip to see what’s new! 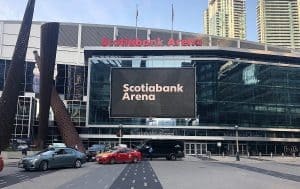 The former Air Canada Center was recently renamed the Scotiabank Arena in a record-setting $800 million deal. Along with the renaming rights, Scotiabank has also announced some changes for inside the arena that will make it a top destination this winter. At Switzer-Carty Transportation, we transport groups of all times to sporting events, concerts and special events in Toronto and throughout Southern Ontario. Oh, and that includes your own sports team, too! Get your group team of friends, or team of players wherever you need to go – on time and safely. Charter a bus with us! From basic signage upgrades to dynamic new video screens, major changes are being planned for the whole building. The high-end Air Canada Club will be remodeled and entrances are being changed to allow for easier access to the arena, which are both parts of the improved fan experience Scotiabank is striving to offer. One big point of pride is the brand-new dynamic sign on the west side of the building. Designed so that each letter in the name of the arena is its own video screen, it will be able to show game moments as they happen, right on the side of the arena. Scotiabank Arena is home to 2 of Canada’s top sports teams: The Toronto Raptors and the Toronto Maple Leafs. Both teams have seasons that are well underway, so provide regular opportunities for fans to come out and cheer them on. The Toronto Maple Leaf’s are Ontario’s NHL hockey team, known for their intense rivalry with the Montreal Canadiens. Check their schedule to pick some tickets for your group outing and see if you can score tickets to watch them face-off against their top rivals or another Canadian team. The Toronto Raptors are the NBA’s only Canadian basketball team and they joined the league in 1995. They have been drawing crowds to the Air Canada Centre, and now the Scotiabank Arena, for over 2 decades! In the 2017-2018 season they won 59 games and finished first in the NBA Eastern Conference, so a game should be at the top of your list of group destinations this winter! The Raptors are sure to put on a great event no matter who they are up against. No matter what size of group you’re looking to entertain, downtown Toronto is the place to go. Grab some dinner and head to Scotiabank Arena to watch your favourite top-tiered sports team win their game! Hiring a bus to get you there is the perfect way to beat the traffic and avoid parking woes in the downtown core. And you can’t beat door to door service!